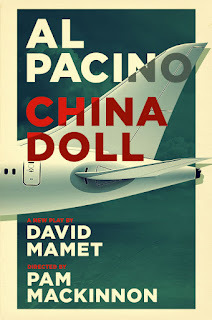 Drama geek: China Doll - Mamet & Pacino for 15 weeks only! China Doll - Mamet & Pacino for 15 weeks only! Mamet's new play, China Doll, is a play about a wealthy man, his young fiancé, and an airplane. The man has just bought a new plane as a wedding present for the girl. He intends to go into semiretirement, and enjoy himself. He's in the process of leaving his office, and is giving last minute instructions to his young assistant. He takes one last phone call...The characters are Mickey Ross, a billionaire; Carson, the assistant, and a telephone. Directed by Tony award winner Pam McKinnon and starring Oscar and Tony award winner Al Pacino, this will be a limited engagement with previews beginning on October 21st and the opening November 19th. The show will run a short 15 weeks. Tickets start at $70 and can be purchased here.